After Week 12 left many players injured, Week 13 followed suit removing a few star players from the field. As the playoffs loom, injuries will play an important role down the stretch for both NFL teams and fantasy teams. With that said, here are the most important injury notes heading into Week 14. After landing a knee injury in Week 12, Melvin Gordon subsequently missed Week 13. However, Adam Schefter reported that there is a chance Gordon returns to the lineup this weekend, and will not sit out past Week 15. While playing this weekend remains a stretch, this looks like positive news for Gordon. He remains doubtful for this week, but he should return for Week 15, assuming positive health. In his first game returning from a toe ailment, A.J. Green suffered a non-contact foot injury. Green had to be carted off with the issue and Adam Schefter later revealed that Green would require surgery to repair torn ligaments in his toe. The Bengals subsequently placed Green on injured reserve, ending his season. Green should enter 2018 healthy following surgery. Also suffering a non-contact foot injury, the Panthers carted off Greg Olsen and immediately ruled him out for the game. Olsen revealed after the match that he ruptured his plantar fascia and the injury will likely end his season. Olsen has been pushing this foot for years, and as he noted, it finally gave way. This could be the end of a very successful career for Greg Olsen. After surprisingly ceding work for Jeff Wilson early in the game, reporters revealed that Matt Breida tweaked his pre-existing ankle injury in warm-ups. Breida entered the game for a few carries, but ultimately spent most of the night on the bench. Speaking on Monday, Kyle Shanahan said that Breida will miss this week's game. Coming as a surprise since Breida has played through the injury all season, this aggravation may be more serious than initially thought. Despite resting through the Chiefs' bye week, Sammy Watkins could not shake his nagging foot ailment. The first-year Chief did not practice at all last week, indicating Watkins could still be a ways away from returning to the field. His practice status should be monitored this week. 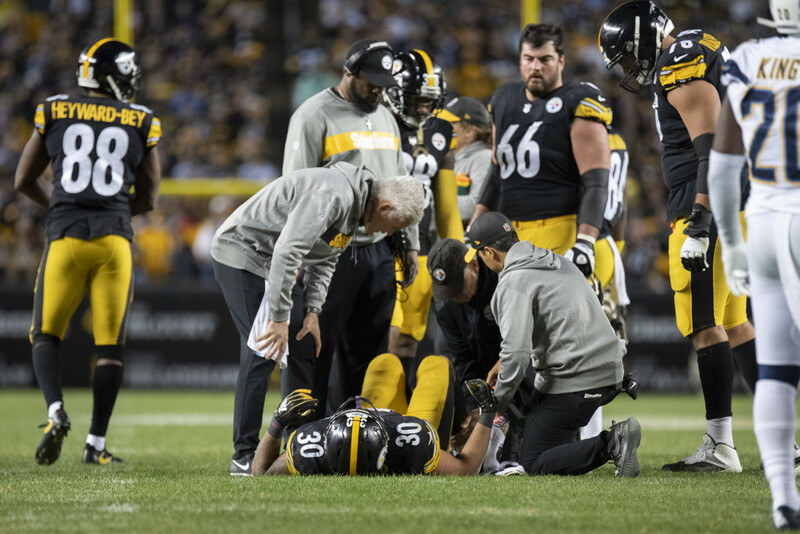 Leaving Sunday Night Football with a scary leg injury, James Conner reportedly suffered an ankle sprain. Speaking Monday, Mike Tomlin ruled out Conner for Week 14, leaving Jaylen Samuels to handle the running back duties. With Conner ruled out so early in the week, his status the rest of the season looks questionable. He should be considered week-to-week for the time being. Struggling through a thumb injury, DeSean Jackson could not play through the ailment in Week 13. Jackson did not catch passes in practice last week and Bucs' beat reporter Jenne Laine said Jackson could be held out the rest of the season. The Bucs have fallen out of the playoff race, leaving no reason to rush back their receiver. Jackson looks unlikely to play again this week, putting Chris Godwin in line for more work. After suffering an MCL sprain, Kerryon Johnson has missed the Lions' last two games. Johnson failed to practice last week and likely needs another week to recover from this sprain. Until he returns to practice, he should be considered doubtful. Dealing with a multi-week hip injury, coach John Harbaugh said he expects Joe Flacco to do more in practice this week. He also said that the doctors will tell him when Flacco can do more. Flacco returned to practice last week, but Ian Rapoport reported that it seems unlikely Lamar Jackson loses the starting job even when Flacco returns. Breaking his foot in Sunday's game, the Arizona Cardinals placed Christian Kirk on injured reserve. This ends a promising rookie season for the Texans A&M product. He should be ready ahead of training camp next year for his second season with Josh Rosen.